The northwest was hit by heavy rain during the week. 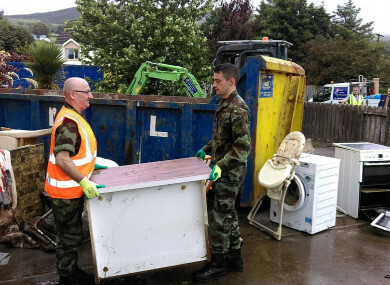 MORE MEMBERS OF the Defence Forces are helping with the cleanup operation in Donegal as flood relief efforts continue in the northwest. Defence Forces personnel arrived in the flood-hit county yesterday and were joined by Taoiseach Leo Varadkar who surveyed the damage and spoke to local homeowners and businesspeople. Minister of State for Flood Relief, Kevin Boxer Moran, meanwhile said that the government should set up a dedicated agency for emergency situations, similar to other European nations. Today, a platoon of troops with 30 personnel and four vehicles have been deployed to clear damage and transport materials. An Air Corps helicopter has also been involved in the ongoing relief operation to survey the damage and plan upcoming relief work. The Defence Forces members are operating in Buncran, Clonmany, Carndonagh and Burnfoot and are there on the request of Donegal County Council. Parts of Donegal and Derry sustained heavy rain on Tuesday bringing with it flooding and widespread damage. Speaking from Buncrana yesterday, the Taoiseach promised that “extra support from central government” would be provided to repair all the damage in the region. Minister Joe McHugh said that some families have been moved to replacement homes, while the Department of Social Protection had given support to nine families. In a statement, Boxer Moran said that the State response to such catastrophic events should be coordinated by a single agency. He said: “There is a huge wealth of experience and expertise within the Defence Forces and the Civil Defence, for example, in providing transport and infrastructure solutions for people trapped in flooded areas and we need to ensure that they are on the ground within hours of a major natural disaster. It has become very clear to me in witnessing at first hand a number of major emergencies in recent years that it is no longer the best approach to leave all the responsibility on the shoulders of the local authorities. Fianna Fáil has, however, been critical of relief efforts with local TD Charlie McConalogue saying that farmers in particular need more financial support from the Department of Agriculture. “Minister Creed should swiftly establish a new Emergency Flood Relief Scheme for eligible farmers affected by Tuesday’s floods,” McConalogue said today. Email “Minister says emergency agency should be set up as army pitches in for second day in Donegal”. Feedback on “Minister says emergency agency should be set up as army pitches in for second day in Donegal”.